Having conquered the east coast, with regular performances at New York City venues such as the Rockwood Music Hall and The Living Room, rock singer / songwriter Amy Regan, was in Los Angeles last week filming a television commercial, that will play nationwide, and in which her folksy song “Carry On,” is featured, but that is all that we can tell you for now, because she made us promise to keep the rest of the details a secret for now. Demonstrating just how quickly the music industry is changing, Amy Regan is riding the success of her EP released two years ago and she is just this month (February) going back into the studio to record her debut full length album. 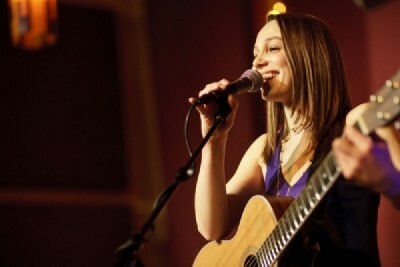 Prior to Christmas, she had a singles release concert at the Rockwood Music Hall at which she unveiled two singles, one of them being the acoustic pop “Gonna Get Better,” which Riveting Riffs Magazine’s writer Gabe Alonso described as a song that sees Regan “digging in and leaving her fans wanting to hear more.” The second song which Regan introduced that night was “Keep You Warm,” a bittersweet song that evokes a strong emotional response from the listener, as the singer realizes her relationship just is not working anymore. “I really wanted to release these songs and I know that the way things are going these days people are mostly buying their music electronically and downloading songs. It really is about the song. I think at the end of the day, we will always appreciate albums and I still want to do albums, because it is a different way to approach releasing music, because you will get a work, which is a whole body of songs, not just songs that have no relationship to each other. I think (however) that it is important to get singles out there, because it is so easy to release music nowadays. You can just go (online) and put your songs on iTunes, so you don’t have to invest in a bunch of CDs and that is something that you can’t ignore,” observes Regan. Riveting Riffs Magazine could not agree more, because it was through facebook that we discovered this gifted singer / songwriter and her music.